The invasive brown marmorated stink bug Halyomorpha halys (Stål) (Hemiptera: Pentatomidae) has become a serious economic pest in parts of the USA, and control tactics are often needed in order to avoid crop losses in tree fruit and other crops. Chemical control is usually the most effective and efficient tactic for preventing damage in crops. Researchers have tested a wide range of insecticides using laboratory and field experiments to determine the best options for H. halys control in the USA. 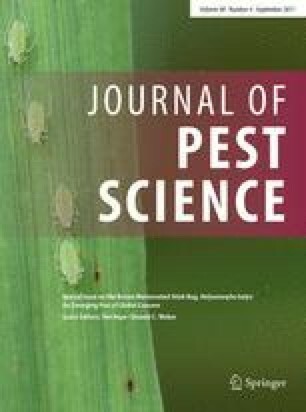 This review summarizes that work and describes current practices with regard to insecticide options for H. halys. Thomas P. Kuhar and Katherine Kamminga have contributed equally in writing the paper. This material is based upon work that is supported by the National Institute of Food and Agriculture, US Department of Agriculture, Specialty Crop Research Initiative under Award Number 2016-51181-25409.